CHARLESTON, W.Va. -- A hairstylist is receiving praise for going above and beyond to help a young boy with autism. 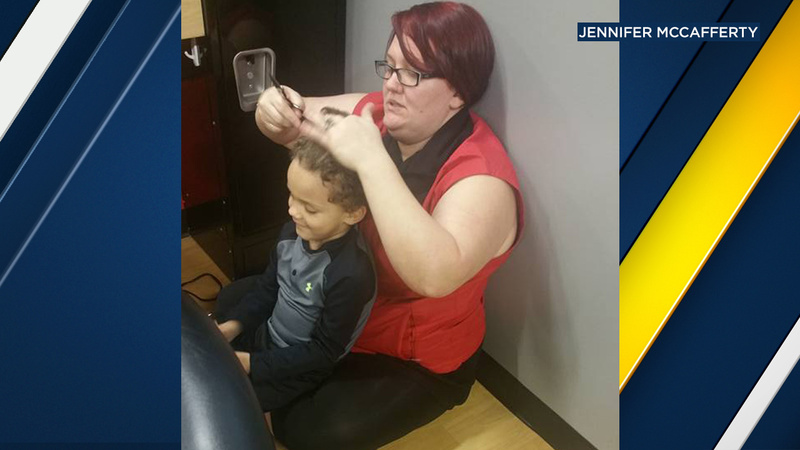 Jennifer McCafferty said she took her son, 4-year-old Isaiah, to get his hair cut at Sports Clips in Charleston, West Virginia. McCafferty said having Isaiah's hair cut is no easy feat. "He hates having anything near his ears, the sound of clippers sends him into a tailspin...this evening was no different. I was ready to give up, but she wasn't," she wrote on Facebook. The hairstylist, later identified as Kaylen Barker, put Isaiah in her lap as she sat on the floor and cut his hair. "They talked about Dory and Christmas, and she even let him spray her with her water bottle," McCafferty wrote. "Autism can be so very, very hard, but people like this make our days just a little easier." After the picture was posted to Facebook and shared more than 27,000 times, Barker was showered with praise. "She was awesome," McCafferty said. "Went so far above and beyond what she had to do. I'm so glad she's getting the recognition that she deserves." Barker said she was humbled and surprised by the response. McCafferty even sent her flowers for her act of kindness. "You absolutely did not have to send me flowers, but thank you. They are just beautiful. I am so beyond happy that I could make his experience less stressful and scary. He made my heart smile. You are so lucky to have such a wonderful little boy. This whole experience has been so humbling and heartwarming. I never knew what impact just doing my job could have on someone. Thank you for letting me cut his hair," Barker commented on Facebook. And according to McCafferty, it appears Barker may have a client for life. "By the end he was crying because he didn't want to be finished," she wrote. "This was our first time there, but we will definitely be back."